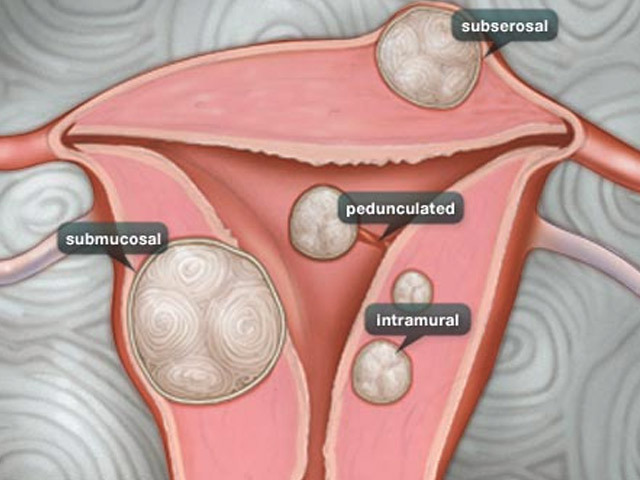 Fibroid tumors are benign smooth muscle tumors of the uterus and occur in up to 70% of women of reproductive age. Your risk for developing fibroids increase with elevated BMI, early first menses and lack of child bearing. Its incidence is also increased in African American women. Pregnancy appears to protect against the development of fibroid tumors reducing your risk for about 10 years after birth. These tumors contain both estradiol and progesterone receptors which is why women have a significant decrease in the size of these tumors after menopause. Most fibroids are asymptomatic and symptoms depend on the number, size and location of the fibroid. Symptoms include abnormal uterine bleeding, pelvic pressure or pelvic pain. Some patients may experience urinary urgency or frequency as well as constipation. Some women may have problems with infertility. Fibroids may compress fallopian tubes or distort the endometrial cavity preventing against proper implantation of an embryo. The diagnosis of a fibroid may be by simple physical examination of an enlarged uterus during a gynecologic examination or with a pelvic sonogram. Treatment options should be discussed with your physician taking into account patient safety and future wishes for fertility. At MacArthur OB/GYN we offer a variety of treatment options. These include minimally invasive techniques such as Symphion, Acessa or Robotic Myomectomy.